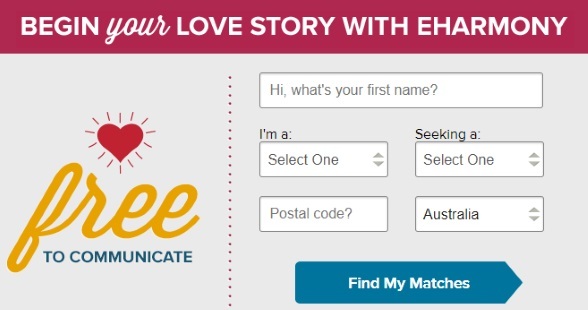 Responsible for over 11 thousand marriages, eharmony Australia is a revolutionary and unique online dating website. Instead of having to search through countless profiles, eharmony evaluates your personality and lifestyle, calculates compatibility and sends you profiles which match who you are and what you really need. The system is grounded in relationship science. To optimize your matching process, eharmony Australia uses its advanced Labs capability, a 2,000 sq foot relationship research facility. It is smarter dating, geared towards singles looking for long-term relationships. The greatest feature of eharmony is the world famous compatibility test. Other sites assume that shared interests are what make a good match. However, often what makes a good couple is compatibility of temperament and values rather than simply loving similar activities or the same music. On eharmony you tell the site about you, rather than about what you want, making dating a scientific process. eharmony is about love offline, too. As well as a premium matchmaking service where you work with offline matchmakers, for those who prefer the personal touch, eharmony also offers also a whole section dedicated to dating and relationship advice. Find here useful information on using the site, as well as relationship science, dating tips, and message boards. Once you’re signed up, you will also have access to the intuitive and informative Book of You, which helps you find out more about yourself than you can imagine, including insights into your dating journey so far. We love the great Secure Call option, where you can speak on the phone to matches without revealing your phone number while you get to know one another. eharmony also offer a fully functional mobile app. While some online dating websites boast the ability to be chatting to singles within minutes, but mostly at random, or at best categorised by location or age, eharmony offers a more targeted service. The time investment you make on sign up is set up to pay dividends in the long run. By filling in the detailed profile questionnaire, based on the scientific 29 dimensions of compatibility, eharmony can match you with singles where the chances are highest of success. The website therefore targets those looking for long term commitment. The questionnaire is thorough, and covers your characteristics, beliefs, values, emotional health and skills. You can sign in and out as much as you please, and your progress will be saved, so try not to rush through the quiz. The more honest you can be the better. Some of the questions will ask you to rank your personality or interests, and think about how true you feel certain statements are. Others will pertain to the match you are looking for, or will be tick box questions such as how you think your friends would describe you. The questionnaire is fun and simple to fill out, and the Book of You which is created as a result is well worth the time spent. Because prospective eharmony members complete a time consuming personality quiz on sign up, it does not easily attract scammers or time wasters. This all helps to cut out unsuitable matches from appearing your inbox. There are also not search tools in the same way as other online dating websites, so you are unlikely to receive abusive or malicious messages. However, you should still ensure that you maintain safety online. The Secure Call function allows you to safely bridge the gap from online to offline with a phone call without revealing your phone number. Monitors at eharmony review profiles, but you must also do your own research before meeting members in person. When a member applies to join, eharmony immediately reviews the applicant's background and match potential. It is recommended to ask a few questions yourself as well. eharmony offers a dedicated safety tips page with everything you need to know before getting started. They recommend you never share personal information or send money to members before meeting first. Also, always meet in a public place. Taking things slowly ensures that you have fun but in a safe and secure way. They offer a direct email address specifically for any concerns you might have. You can sign up to eharmony free of charge, and even see what profiles are being suggested for you, plus build a stunning profile of your own. Once you're ready to communicate with other members you'll need to splash out on a paid subscription. These are priced on the higher end of the scale, which is because of the amount of work which goes on behind the scenes, matchmaking. The cheapest option is 12 months, at $25.95 per month. The price raises to $45.95 for a six month membership, and the most expensive option is trying the site out for 3 months, at $59.95 per month. It is very easy and fun to use this system. eharmony means that you get messages only from compatible matches, whereas other sites can result in an inbox filled with unwanted mail and being pestered by unsuitable members. Navigating eharmony is straightforward too, with updating your profile being quick and easy to do. Signing up is simple and the questions you need to answer are fun and important ideas to think about anyway, if you are serious about dating and finding love. The system will then send you profiles to look at. If someone looks good, get in touch and see if the chemistry really is there. You can also see which profiles you have viewed previously and your dating history. You will enjoy using this site which is modern scientific dating at its best. On eharmony, the search is really done for you. Rather than spending time emailing potential matches without really knowing if you are compatible, eharmony sends you profiles to review. If you like what you see then get in touch and start seeing whether sparks fly. The site offers communication features rather than search features. There are two forms of communication to choose from, standard and fast track. The fast track option involves writing emails directly to members rather than using the multiple choice question and answers of the standard system. With the standard steered communication feature, you select a few multiple-choice questions for your potential match. The other person will answer your questions and send some of their own for you to answer. After a couple of rounds of messages you move to maybe talking by secure phone and then meeting in person. With over 1.5 million users in Australia, all looking for long-term commitment and love, eharmony is the best compatibility website on the market. Almost 10 years of experience and an ongoing research lab make them experts in relationships, and the time given to taking their unique personality questionnaire is well worth the investment. Our editorial staff is comprised of writers who are passionate about the world of online consumer services. We specialize in simplifying the process of choosing the right online dating site for your needs.